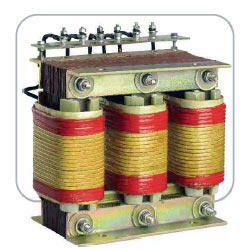 Manufacturer of a wide range of products which include harmonic filter reactor. We are one of the eminent entity engaged in offering a wide range of Harmonic Filter Reactor that is highly powerful in ensuring that is provides the adequate power demand in case of low power factor this ensures no power looses and further saves on energy and cost evolved. Additionally, our customers have found a nominal reduction in their bills due to the efficient functioning of our Harmonic Filter Reactor.